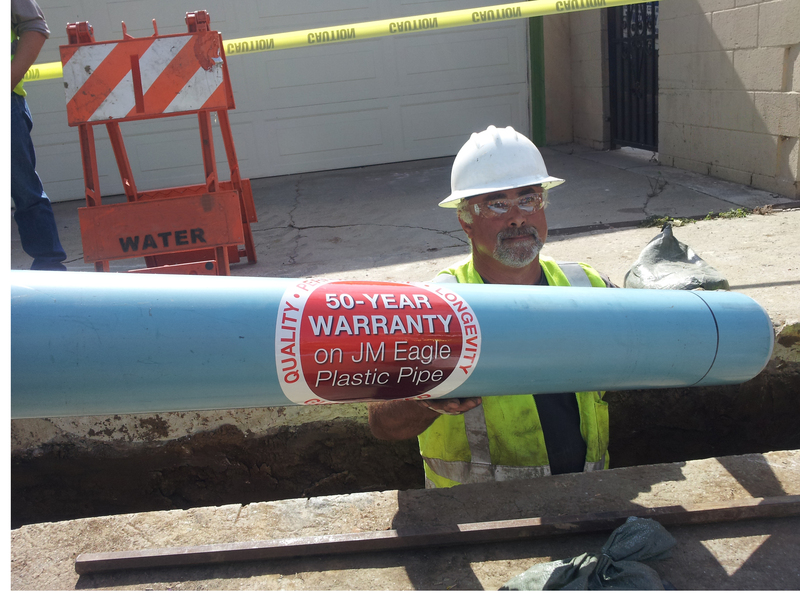 At JM Eagle, we have always stood behind the quality of our plastic pipe as our commitment to serving you. Now we are taking that commitment a step further with the introduction of our 50-year warranty on the design of our innovative engineered thermal plastic-pipe products. * This means you can trust JM Eagle pipe to maintain its performance for the next 50 years or we will replace it. ** No other manufacturer makes this claim. The warranty covers issues associated with new verifiable manufacturing defects on pipe. The warranty also covers plastic-pipe products sold and installed since JM Manufacturing’s inception, manufactured by JM Eagle or JMM. It does not cover products made by other manufacturers acquired by JM Eagle at later date or products manufactured by PW Eagle prior to the 2007 merger. Plastic pipe is the safe, long-lasting and stable solution for a modern infrastructure. Millions of miles of plastic pipe have been installed throughout the country. It outlasts any other material. It complies to strict industry standards that confirm its strength, durability and longevity. And it keeps the water flowing without bursts, flooding or disruptions. Plastic pipe from JM Eagle is of the highest quality. It has always met—and will continue to meet—the standards of the American Water Works Association, and it has always been—and will continue to be—certified by NSF International and Underwriters Laboratories. We are excited to bring this warranty to you, for the betterment of your business and the industry as a whole. We hope that you will continue to choose plastic pipe, and choose it from the only plastic-pipe manufacturer that stands behind its quality with a 50-year warranty, JM Eagle. Information on this Web site tells you more about our warranty, our products and our commitment to serving you with quality plastic pipe. We hope you find it helpful as we continue our long and fruitful partnership. *	Plastic pipe certified to AWWA for water distribution and transmission and force sewer mains. **	See warranty for full details. statement of our quality, performance, and longevity.